A few changes to your banking habits can net you more money than you think. When was the last time you checked how your bank was treating you? It’s easy to leave your money in a bank with a local branch, use the same ATM and see the same cashiers year after year. Unfortunately, that familiar habit could mean you’re missing out on hundreds, or even thousands, of dollars of easy money. We checked to see how much we could save a hypothetical senior with $45,000 in cash, keeping the money both accessible and safe. Watch for the underlined results, below. Switching to a credit union or a local bank can give your account a big boost. Use your computer to shop around for the best deals, and you may be surprised at what you find. Take the widely available Kasasa accounts, for example, that come in three basic flavors. Free checking with Kasasa Cash offers users cash rewards each month they qualify. There are no account minimums or monthly service fees, and ATM fees are refunded nationwide. Best of all, Kasasa Cash accounts earn an interest rate that is typically much higher than traditional accounts, up to 5 percent on as much as $10,000 as of this writing. Here’s a link to current rates. Or you might choose Kasasa Cash Back, a checking account that earns users cash back on purchases made with their debit card. There are no restrictions on the type or category of purchases, no minimum balance and no monthly service fee. You can pair the free Kasasa Saver account can be paired with any Kasasa checking account at the same financial institution. Kasasa Saver automatically sets aside your Kasasa checking account’s earned cash rewards without any special effort required. In addition, this option provides a high interest rate on savings. What’s the catch? Kasasa accounts limit the amount of money, typically $10,000 or $15,000, which earns the high rate. They also require online banking and e-statements, which may be a change for seniors. To qualify for Kasasa Cash, you have to make a specified number of purchases, typically 15, with a debit card each month. And there must be a monthly automatic deposit, but you can choose to cycle that deposit in and out of another high interest account (read on). Hint: A pack of gum or can of soup qualifies as a purchase. You can buy several items at the same time with separate transactions in the self-serve line. Interest earned on $10,000 at five percent in a year: $500. So you’re keeping the maximum amount you can in a Kasasa checking account and earning double what a 10-year treasury bond would pay, but you still have some cash left over and you want to stash it in a safe place. If your current bank doesn’t pay much more than your mattress, it’s time to open a high-interest savings account at an online bank. 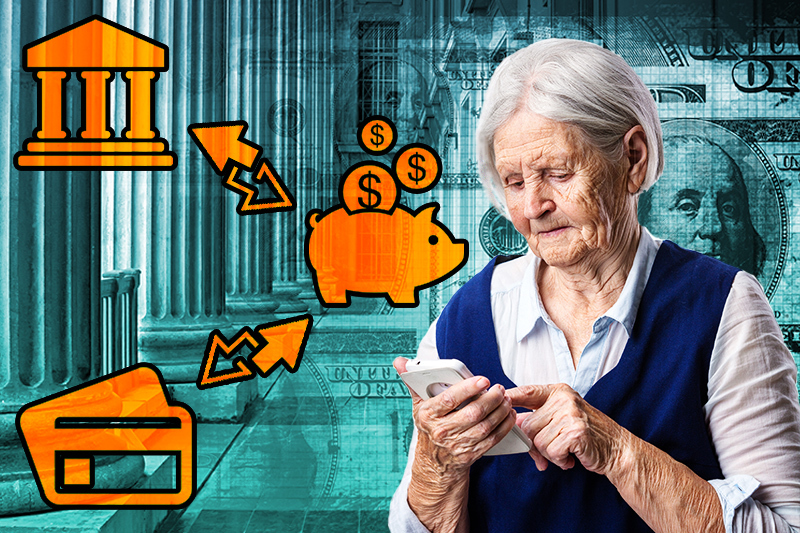 While there are many to choose from, seniors might want to look for features such as 24/7 customer support by phone, ease of site navigation and high customer satisfaction ratings, as well as a great interest rate. Find your best deal here. Hint: You can meet the requirement for the automatic deposit in your Kasasa checking account by setting up monthly transfers from your high interest savings account. And if you already have the maximum amount that earns rewards in your Kasasa account, simply set up an automated withdrawal a week or two later out of your Kasasa account and back into savings. If you’re in debt, the most important thing you can do with your money is pay it down. But for debt-free seniors with the dedication to pay off a credit card balance every month, it’s time to take a look in your wallet. According to research at CreditCards.com, nearly one-third of seniors have been using the same credit card most often for at least 10 years, and another 20 percent have never switched from their primary card. That’s leaving money on the table. Why? Credit cards have become tools for savvy consumers to make some extra cash. To begin, know your credit score. You have the right to request a free report annually, but most financial institutions now offer that information online as a freebie. The better your credit score, the more options you’ll have for a sweet card deal. Next, decide if it matters to you whether it’s a Visa, MasterCard, American Express or Discover. The first two are accepted pretty much everywhere, but if you want to use a card at your local Costco, for example, it’s got to be a Visa. The latter cards generally offer great deals for consumers, but are not as widely accepted. Finally, it’s time to go online and compare cards. Here’s a link to one site that is user friendly and offers various search options. Look for a card that has no annual fee, pays the maximum cash back and gives you a tidy bonus upfront. For example, the popular Quicksilver card is available to seniors with good credit and offers a $150 cash bonus after you spend $500 on purchases in the first three months. It pays a 1.5 percent return on every purchase. If you spend $200 a month with a similar card, you could earn $186 the first year. Interest earned on $10,000 at 1.15 percent in a year: $115. But wait, is that the best you can do? You still have some cash that you want to stow in a secure place without tying it up. Enter the No Penalty CD. You can cash it out without penalty any time after six days, and it’s completely guaranteed by the Federal Deposit Insurance Corporation (FDIC). Or, leave it in place for the full 11 months and get a nice return. How do big, conventional banks stack up? For $25,000, Bank of America will pay you a measly annual percentage yield of 0.04 percent, or PNC Bank will pop that up to 0.15 percent. Hardly worth it when your new, online savings account earns far more. But put that same $25,000 into an 11-month CD with online-only Ally Bank, for instance, and your yield becomes a tidy 1.5 percent. Interest earned on $25,000 at 1.5 percent in a year: $375. Does your current bank charge a fee for your checking account? More than 2 out of 3 banks charge monthly maintenance fees for checking, according to a recent MoneyRates survey. The average monthly fee across big, medium and small banks alike was $13.22. Cost to pay maintenance fee on checking account per year: $158.64. Hold on, you say, I never pay the monthly service fee because I keep enough in my account to avoid it. Well, that is costing you, too. The average balance needed to qualify for that fee waiver jumped nearly 32 percent in the last six months, to $11,469.25. What if you could put that money in your savings account earning 1.15 percent interest instead? Loss of earnings on $11,469.25 at 1.15 percent annually: $131.89. And what if you get hit with an overdraft fee? The average penalty is now $32.34, which can add up to quite a sum if you overdraw your account multiple times. Cost of a single overdraft fee: $32.34. At the end of a year, our senior has earned $990 in interest, and avoided about $150 in bank fees, for a net gain of more than $1,100. “Research free Kasasa® checking accounts,” Deposits Online, LLC. “The latest MoneyRates.com update on bank fees,” MoneyRates.com. “Find a credit card that's right for you,” creditcards.com. “Research Bank & Credit Union Accounts,” Deposits Online, LLC.